Problematic and inconvenient at the same time, running toilets are a common reason why Sunshine Plumbing and Gas provides plumbing services to homes and businesses each day. The sound of running water can quickly become background noise, but ignoring a running toilet only means energy efficiency and money running out the door — a running toilet quickly wastes gallons of water while increasing your utility bill. 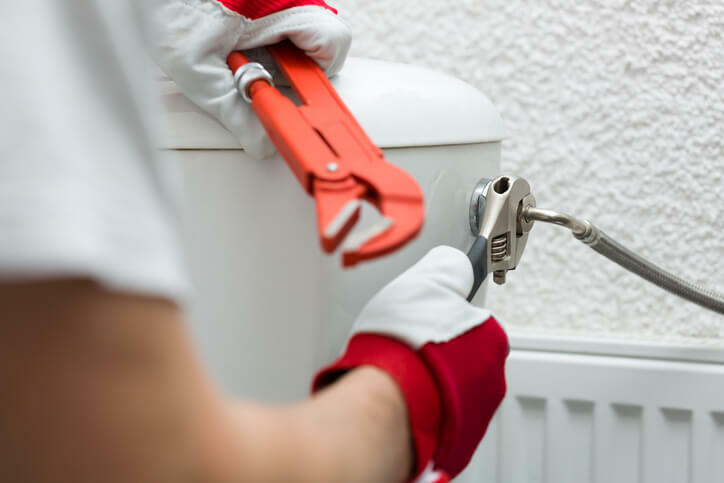 Our plumbers have the experience and skills necessary to troubleshoot the cause and make repairs to fix any running toilet, saving you money in the long-term. Letting a seemingly small plumbing issue fester can quickly cause a disaster situation to develop. As soon as you realize the troubleshoot and quick fixes you’ve tried aren’t working, contact our plumbing repair company. What Are Common Causes Of A Running Toilet? Often times, the causes of a running toilet are simple and can be repaired without having to call the plumber for help. To perform these repairs, you won’t need much beyond a screwdriver and can-do attitude in most cases to fix a running toilet in your home or business. If your home or business has hard water, minerals build up on the toilet’s mechanisms over time. This buildup causes the mechanisms to jam and seals to break, allowing water to flow, or not, at the wrong times. Mineral buildup in the toilet tank can cause other issues in your Ocala plumbing. This rubber or plastic cap, commonly known as a flapper, is what keeps water inside the toilet tank. As with any rubber or plastic object, over time the flapper will become brittle as it wears out and allows water to leak from the tank. The ball float is responsible for keeping the appropriate amount of water inside the tank and not overflowing into the bathroom. If it’s set too high, small amounts of water will enter the toilet bowl from the overflow tube, causing frequent refilling cycles. But if the float is set too low, the subsequent low in-tank level of water will trigger refilling more than it should. What Should I Do For A Running Toilet? There are a few quick fixes you can employ when you have a running toilet, including the following steps. For expert plumbing help — from fixing clogged toilet drains to toilet replacements — contact Sunshine Plumbing and Gas. The fill tube is a small flexible tube that runs from the fill valve into the overflow tube. If the fill tube falls off, or if running water doesn't reach the overflow tube, the toilet bowl will not fill adequately. If the fill tube isn’t placed correctly, reattach it so that it’s about an inch above the rim of the overflow tube. Proceed to flush the toilet and ensure the water flows downward into the overflow tube. Whether you’d like a professional to inspect your adjustments to the running toilet or you feel more comfortable letting an expert perform your toilet repair, Sunshine Plumbing and Gas has you covered. Our technicians will explain each step and answer any questions you may have. We can also provide you with tips for what to do for maintaining your toilet in between services. Sometimes, due to the frequency of use for toilets in a home or business, the float or refill valve becomes loose over time, letting water run more than it should. On top of most fill valves, you’ll see an adjustment screw — this controls how high or low the float is positioned in the tank. Use a flat-head screwdriver to raise or lower the float to either allow more water into the tank or lessen the flow. Check that the flapper is lying completely flat on the tank bottom. Sometimes another object can become stuck underneath and not allow it to seal correctly or the chain is caught on a nearby tube. Remove any object breaking the flapper seal and/or gently adjust the flapper until it is flat and sealed again.